We evaluate the use of clickthrough information as implicit relevance feedback in sessions. We employ records of user interactions with a search system for pictures retrieval: issued queries, clicked images, and purchased content; we investigate whether and how much of the past search history should be used in a feedback loop. We also assess the benefit of using clicked data as positive tokens of relevance to the task of estimating the probability of an image to be purchased. Boscarino, C, de Vries, A.P, Hollink, V, & van Ossenbruggen, J.R. (2011). 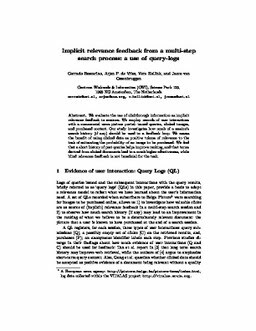 Implicit relevance feedback from a multi-step search process: a use of query-logs. In Proceedings of ECIR 2011 Workshop on Information Retrieval Over Query Sessions 2011. Springer.